Amigurumi is a Japanese craft that involves knitting or crocheting small stuffed toys. The term comes from a combination of the Japanese words ami (crocheted or knitted) and nuigurumi (stuffed doll). 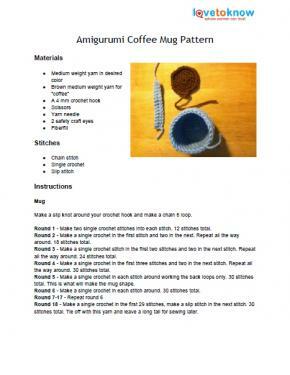 The following free patterns offer three different variations on this popular style of crochet. The most common amigurumi figures are animals including cats, dogs, fish, bears and rabbits. However, some crafters design inanimate objects endowed with anthropomorphic features. Amigurumi crafts are typically cute and whimsical in appearance. The trademark look is a toy with an oversized spherical head on a cylindrical body with undersized extremities. 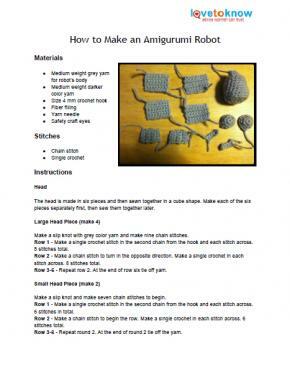 Try one of these patterns to create your own amigurumi character. To use the patterns, click on the corresponding link for the pattern you wish to try. The printable PDF will open in a new window or tab, and from there you can download or print the pattern. If you need help downloading the printable, check out these helpful tips. 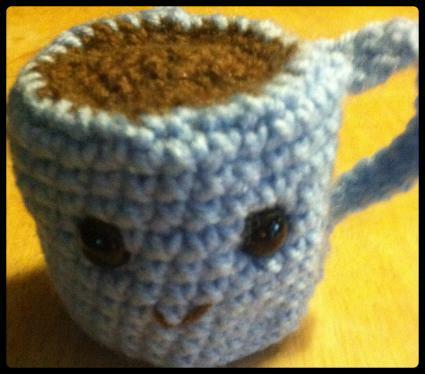 The coffee drinkers in your life will love this cute coffee cup amigurumi. Download this free printable pattern. 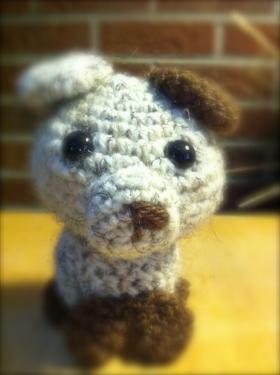 This little dog can be made with whatever colors of yarn you have onhand. This robot is cute and fun to play with. Download this free robot pattern. Remember that amigurumi are made in pieces. When you make a project, you'll have pieces for the head, the body, the arms, and the legs that need to be assembled when the project is complete. Don't leave a hole when you start your rounds, or you'll end up with a doll that is losing stuffing. Don't skimp on stuffing. The best amigurumi toys are tightly stuffed for a full appearance. If you can, add the face after the project is assembled. This will make it easier to determine the correct proportions. Although amigurumi toys are often given to children, it's important to be cautious when creating a project to give as a gift to a baby or toddler. Buttons, snaps, charms, tags, ribbons, or other embellishments that may fall off and present a choking hazard should not be used on toys for young children. Lion Brand is a wonderful resource for learning more about this fun craft. The site's selection of free patterns includes a turtle, fish, octopus, Siamese cat, wise owl, giraffe, bunny, and panda. Pepika has a 3D heart and a free holiday chick pattern, as well as a "crash course" to help you master basic concepts in creating amigurumi toys. 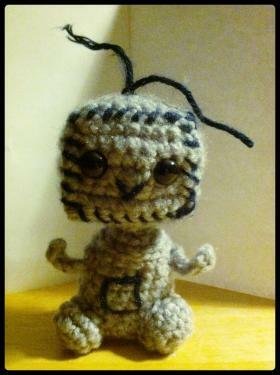 Crochet Me has a free pattern for an "amigurumi dude." Ravelry has a fun free pattern for an amigurumi popsicle toy. The problem with looking for amigurumi patterns online is that many sites devoted to this craft are written in Japanese. 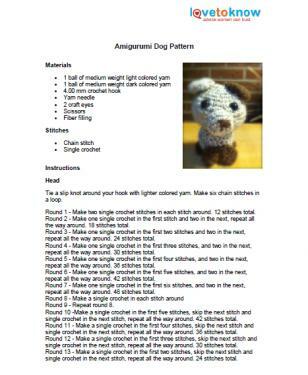 If you're feeling ambitious and want to tackle a project made from a Japanese pattern, however, My Little Mochi has prepared a PDF download featuring English translations of some of the most commonly used abbreviations..
Making crocheted amigurumi toys just makes you smile. The patterns are creative and not overly complicated. Once you start crocheting the amigurumi way you won't be able to stop. Remember, these make great Christmas, birthday or anytime gifts.